Today we're talking about trendy pieces and I'm sharing two different looks with you. Firstly I want to talk about the shirt dress, which has to be one of the most versatile pieces you can own, well you know except a multiway dress. It can be worn as a dress, be it sporty paired with Superstars or edgy with boots or elegant with heels. However you can also wear it as a blouse with jeans, like I styled it today or with a skirt. Today I tucked half of it in my jeans and slid it off the shoulders revealing a strapy bralette. I was recently contacted by Zaful and after scrolling through their site, I fell for all the trendy pieces they offered at affordable prices. Shopping at an affordable price is the perfect way to test out the new trends and it's also a great way to play with your style. For the first look I chose this embroidered shirt dress and this cute bralette. The sparkly bird details are what made me choose this dress, because embroidered details are all the rave right now and they offer a pop to the outfit, since the sparkles catch the eye. 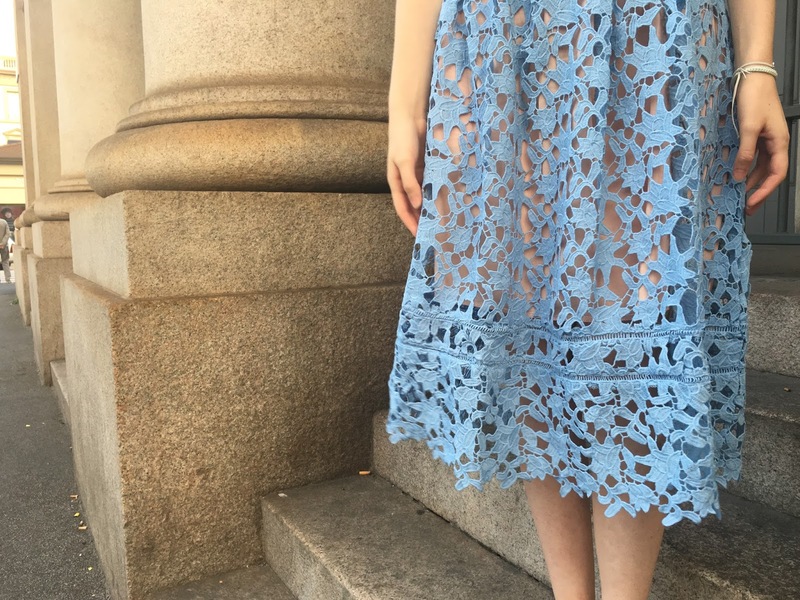 The second look consists of this gorgeous midi blue crochet dress. The details on this dress are insane, they make the look flirty and elegant. This would work beautifully at a formal party when paired with heels or on a date, styled like I did today. I am happy to share that the quality of the items I received is great, they aren't flimsy and look exactly like on the site. The packaging arrived from Singapore in a weeks time, which was very convenient. You can see perfectly from the pictures how well they fit and all the details. Though these items were gifted to me, my opinions are 100% honest and the pictures show the truth. I am looking forward to style these pieces in further posts. Have you heard about Zaful and what was your experience with them? Cute outfits! Zaful is an affordable website so it's awesome you found these cute pieces! I love both looks! Very chic and on trend. So beautiful, I love all of your clothes! I love Zaful! That top is creatively beautiful, and the dress is elegant on you. Have a great week dear. I really liked their looks! But the first was my favorite ♥ nice choker! the last dress is sooooo beautiful, love it. both looks are absolutely amazing...you look totally awesome! Happy Monday Carina! I absolutely adore both looks! Very beautiful. Have a great week ahead! That blue dress is stunning! I love the two looks so much!! How funny, I have never heard of Zaful before, but just read about them on a blog about a minute before I read your post! The stuff you picked out looks lovely and you look great in it! Wow, you look great! The dress is stunning and so pretty, love it. I'm in love with this blue dress! I loved your choices! I have some clothes from Zaful too and it has such quality! Great looks! I especially love the dress! Love all the looks so much! the pink dress is my absolute favorite! I absolutely love the blue dress! It's gorgeous! Omg you are too cute! We have a Zaful post coming up next week! You look gorgeous! You are definitely great in both outfit looks! The edgy and dainty. Hope to see more of this trendy style from you Carina. I love that Zaful is both trendy and affordable! The bird details on that shirt are awesome! While I like the embroidery shirt, I am in love with the dress and if you didn't say it's from Zaful, I would have thought you got it from Asos or something. It's stunning! Carina, you look like a female artist Michelle Joan Indonesia your faces so alike and like twins. love your looks!! that dress is so lovely! the color is amazing! Gorgeous outfits! I'm so in love with the blue lace dress, it's beautiful! I love that pretty blue dress ! You look lovely in both outfits, I like Zaful too as I recently did a review of their dresses. I really like your blog, do you want to follow each other? Please let me know, thanks. I did read that Zaful is a great store and I can see it here! You are always so gorgeous, I loved the embroidered shirt and the bralette, so cute! And my favorite is the amazing crochet dress, it's so beautiful and feminine! Hope you have a very good day! Gorgeous lace dress! It's just so pretty! Wow! Nice photos and beautiful set! My latest post is also about Zaful so if you want you can check it. Such 2 beautiful looks ! I love your blue lace dress ! so pretty. What a great look! I especially love your hair! How beautiful! You look chic and cool at the same time! OMG! That blue dress <3 Gorg. Love the embroidery! Such a fun trend for fall. And that blue dress is beautiful!! Both these pieces were meant for you! the blue is so Pretty! I am more lover of second style. Actually, I am in love with your blue dress. So trendy and cool I love these outfits wow! Love the both looks! Gorgeous! I love Zaful! They have really great pieces, and I agree that each of the items are reasonably priced, makes testing trends a piece of cake! This is really a trendy and cool look! You're so beautiful and chic Carina, you make everything look high-end! The shirt looks gorgeous in the way you've styled it and the light blue shade of the dress is perfect. Zaful contacted me today. I would like to know if the partnership was great ? The lace dress is so gorgeous! It looks so much more expensive then it actually is! !